Home :: Outdoor Radios :: Mikrotik Outdoor Radios :: Mikrotik RBQRTG-2SHPnD is a high gain, high speed 2.4GHz oudoor wireless device. Dual polarization 802.11n and Nv2 TDMA technology help to achieve even 200Mbit real throughput speed - New! 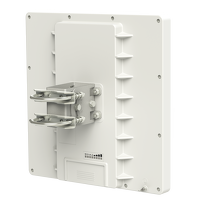 Mikrotik RBQRTG-2SHPnD is a high gain, high speed 2.4GHz oudoor wireless device. Dual polarization 802.11n and Nv2 TDMA technology help to achieve even 200Mbit real throughput speed - New! Mikrotik RouterBoard QRT-2 (RBQRTG-2SHPnD) is rugged outdoor flat panel antenna, with a built in RouterBOARD. 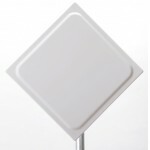 The device has a 17dBi dual polarity antenna and a super high power 2Ghz wireless transmitter. Gigabit Ethernet allows full radio throughput to your network. Complete with a ready to mount enclosure and built-in 17dBi 22 degree dual polarity antenna, the package contains everything you need to set it up in a matter of minutes. The inside of the case is covered in special shielding to improve operation in high interference areas and antenna front to back ratio. Box contains: QRT wireless device with integrated antenna, pole mounting bracket, mounting ring, PoE injector, power adapter, quick setup guide.